The Google Earth image above shows a recent perimeter for the 2018 Woolsey Fire along with GPS tracks of the Backbone Trail and some other trails in the region. 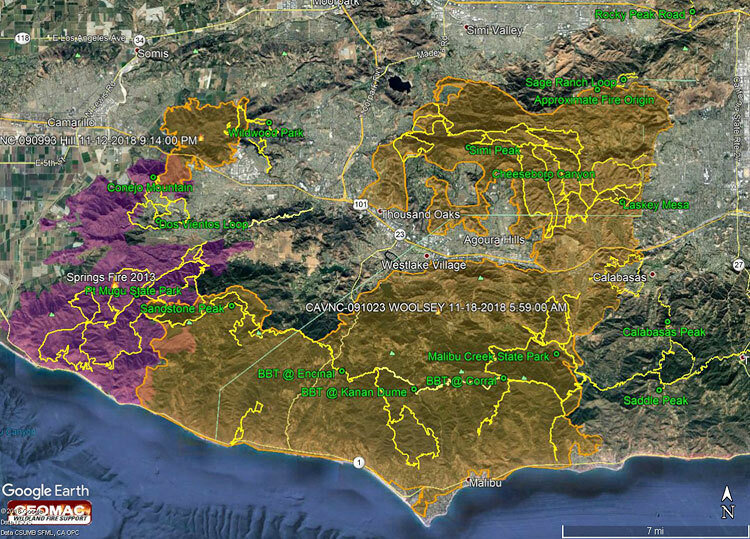 The Hill Fire perimeter and 2013 Springs Fire perimeter (purple area) are also shown. Trail and placename locations should be considered approximate. Here is a larger version of the map. The perimeter was was downloaded from GEOMAC and timestamped November 18, 2018 at 5:59 a.m. If the timestamp of the perimeter of the displayed map doesn’t match, try refreshing/reloading this page. The perimeter has been refined and the acreage is a slightly less than previously specified. As of November 21, 2018 6:11 p.m., the Cal Fire Incident Page for the Woolsey Fire indicated that the fire had burned 96,949 acres and was 100% contained. The fire started on November 8, 2018 2:24 p.m.